We offer Great Quality Green Screen Video Production! 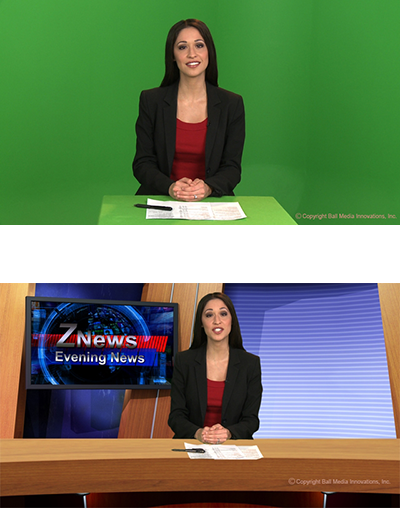 To the left is a photo example of a green screen video we produced. You can see the before and after effects. Green screen video production allows you to use your imagination to the max! Plus it can reduce your production costs, while helping you deliver your message effectively. How do we create green screen videos? First we film in front of a green screen, and then in post-production we use special software that allows us to remove the green screen. Now all we have left is the actor/presenter and any props we want in the video. Next we insert the virtual set and you get magic! 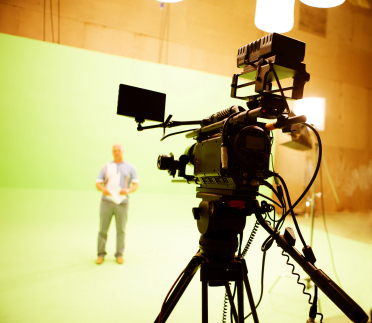 Put your acting talent or presenter into any location with green screen video production! Our staff can locate the perfect virtual background for you, we can create one, or we can use your photos. We offer an Emmy award winning graphic artist, and our rates are competitive! Your actor/spokesperson can appear almost anywhere – in a beautiful executive office, a high tech set with TV screens playing video clips, in front of a city skyline visible out of the windows, in your manufacturing plant, and even on a spacecraft! The choice is yours. Sometimes its best to shoot your green screen video in a studio, but often we can shoot it at your location, saving you money. Add Support Graphics. There are so many ways to use graphics! For example we can add words on the screen, using special effects if you wish (like having the words fly in and out, or having them fly around the acting talent). They can help emphasize key points of your message. We can brand your video by having the actor stand in front of your logo. Anything you need, we can create! You can count on BMI to take care of all your green screen video projects. Why Choose Us for Green Screen Video Production? Top local, national and international crews, technicians and artists. We offer only highly experienced people. They’re true, proven professionals. State-of-the-art equipment. We use broadcast quality digital equipment. We use the good stuff, and it shows! Above and Beyond Personal Service. We do whatever it takes to make things easy for you, and to produce a fantastic video for you. We value your business and we want you to use us again and again. Small or large, your video will receive our full attention! Extensive Experience in Video for Business, Training, Corporate Communications, PR, web videos, medical, etc. Check out our specialties by clicking on the “Video Services” button at the top of the page. Then choose the “Our Specialties” drop down to view our various specialties. You’ll see that we bring much more to you. Read our article on using green screen video production for corporate business and medical purposes. It’s so easy. Just call or use the form on the right to get in touch. We’d be happy to discuss your video project with you. We’ll even give you some ideas that can help your video succeed. There’s no obligation.